How much does it cost to travel to Costa de Prata? How much money will you need in Costa de Prata? €121 ($136) is the average daily price for traveling in Costa de Prata. The average price of food for one day is €35 ($40). The average price of a hotel for a couple is €124 ($139). Additional pricing is in the table below. These average travel prices have been collected from other travelers to help you plan your own travel budget. How expensive is Costa de Prata? Costa de Prata is a region located on the Silver Coast of Portugal, an hour north of Lisbon. The area is known for its beautiful beaches, ancient architecture, and relaxed, welcoming, atmosphere. The area experiences gorgeous weather nearly all year round, with temperatures in the high 70's and 80's Fahrenheit from May-September. June-August sees the warmest ocean temperatures, making these the best months for swimming. Even during their winter, temperatures rarely dip below 60°F, although ocean temperatures drop, making swimming a bit colder. Costa de Prata is home to some of the most beautiful sights in Portugal, one of which is the Monastery of Alcobaca, a UNESCO World Heritage Site. This gothic abbey is Portugal's largest church, dating back to the 12th century. The abbey holds the tombs of the famous Dom Pedro and Ines de Castro, who were considered the Romeo and Juliet of Portugal due to their torrid love story. Enjoy more of Portugal's history in Obidos, an ancient walled city with terrocota roof houses, cobbled streets, and a castle on it's highest hilltop. Spend the day wandering through the winding streets and alleys, stumbling upon beautiful little craft shops and traditional restaurants. Head to Sintra to enjoy beautiful architecture surrounded by nature. At the Palacio Nacional de Pena, you'll find a huge palace atop a hill which is so large, it can even be viewed from Lisbon. 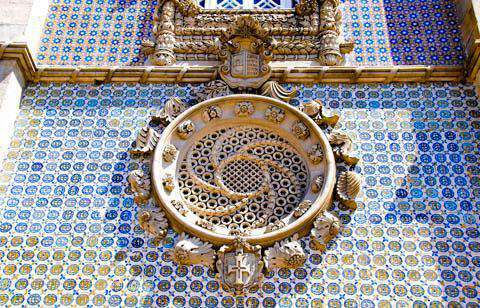 This palace is listed as one of the Seven Wonders of Portugal and boasts dazzling romantic architecture. The Palacio Nacional de Sintra, a UNESCO World Heritage Site, features royal architecture from the medieval period. Finally, there is the Castelo dos Mouros, a Moorish castle that dates back to the 8th century with breathtaking views of the surrounding area from atop one of its towers. Obidos: An ancient city, the whole of which has been declared a national monument. It features gorgeous beaches and stunning architecture. Peniche: A popular town located on a peninsula, offering world renowned surfing spots, beaches, and ancient architecture to explore. Nazare: An old fishing village which has now become one of the most popular destinations on the Silver Coast, it is home to markets, museums, and lovely old buildings. Fatima: One of the most famous pilgrimage cities in the world, famous for their many churches and basilicas. Alcobaca: An ancient city dating back to the 10th century, best known for the Monastery of Alcobaca. Marinha Grande: A small city known for their glass production and for being home to one of the most beautiful beaches in Portugal, the Sao Pedro de Moel beach. Figueira da Foz: A seaside resort town that is home to dozens of walking and cycling trails. Sintra: A stunning town full of palaces and castles surrounded by incredible natural beauty. One of the best activities in Costa de Prata is spending the day at the beach, and with miles of coastline, there are plenty of beaches to explore. Peniche offers many beaches ranging from the perfect swimming spots to world renowned surfing locations. Peniche is one of the best places to learn how to surf, with many surf schools throughout the area. For incredible views, head to Sao Pedro de Moel beach in Marinha Grande which is considered to be one of the most beautiful beaches in Portugal. There are also dozens of walking and cycling trails throughout the area, one of the most popular is located in Figueira da Foz. This trail takes you along the seafront then through a pine forest where you'll catch glimpses of the ocean between the trees. Or, take a walk through the nature reserve on Berlenga, an archipelago near Peniche full of exotic vegetation, animals, and surrounded by crystal clear waters. Costa de Prata has some of the best seafood in Portugal, with sea bass, eels, lobster, and mussels being staples in many dishes. One such dish is Caldeirada de Piexe, a fish stew that can be found in nearly every restaurant. Lagosta Suada is another popular dish consisting of steamed lobster with tomatoes and wine. Obidos is known for their Ginjinha, a cherry liquor which is served inside a chocolate cup. It is fairly easy to find great food in each city, especially with many of the cities being home to fabulous resorts with fantastic restaurants. The easiest way to get into the Costa de Prata area is to come from Lisbon, which is home to an international airport. From Lisbon, you can take a bus to one of the many stations dotted throughout the Costa de Prata area, or take a taxi there. Having a rented car makes getting in even easier as there are plenty of highways and nice roads leading into Costa de Prata. Most cities can be explored on foot, although taxis are available if traveling longer distances. Public buses and renting a car are the two best options for traveling from city to city.